New York artist Andre Woolery has a knack for a visually stunning portrait (check out, in particular, the Erykah Badu and Muhammad Ali in his shop). 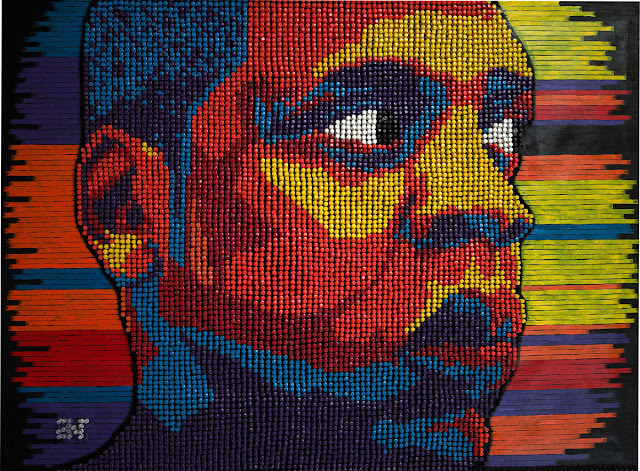 But perhaps his most pointed (pun intended) and stunning work his recreation of Jay Z ("The Tackover") entirely out of thumb tacks. If you can't afford the original, he also offers some sharp photo prints of the work. And a good cause to boot: 20% of proceeds go to Harlem School of Arts.